ST. PAUL, Minn., Oct. 17, 2018 – The Board of Trustees of Minnesota State Colleges and Universities has named Eric Davis to serve as vice chancellor of human resources. The appointment becomes effective January 7, 2019. Davis has over 23 years of progressive experience in human resources management. 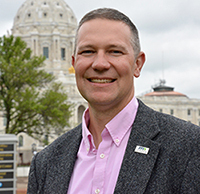 He has served the Minnesota Department of Transportation in various capacities including his current role as Chief of Staff since 2013. Previously, he served as enterprise risk management project director from 2012-2013, as human resources director from 2008-2012, and as assistant director of the Office of Workforce Development from 2003-2005. He also served the Stillwater Area Public Schools as human resources supervisor from 2005 to 2008. Davis is an Air Force Reserve officer serving as the IMA deputy commander for the 30th Space Wing at Vandenberg Air Force Base since 2016, and also served as the national ombudsman for the National Committee for Employer Support of the Guard and Reserve (ESGR) from 2000 to 2016. He holds a bachelor’s degree from James Madison University (VA) and a master’s from Chapman University (CA). Davis will succeed Susan Appelquist, who has been serving as interim vice chancellor of Human Resources following the retirement of Mark Carlson in December 2017.